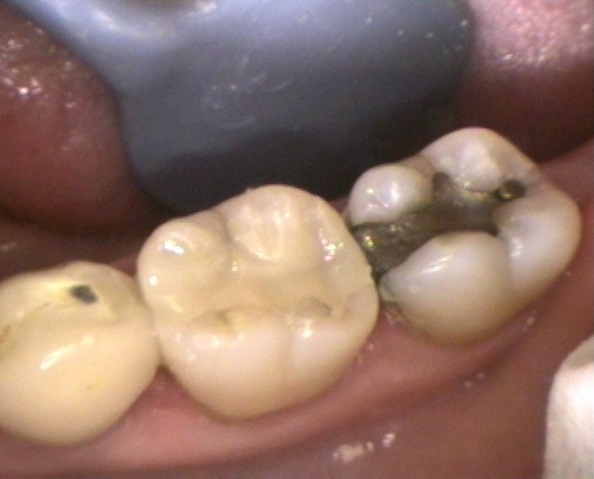 Before and after pictures of repairing an old cracked filling. 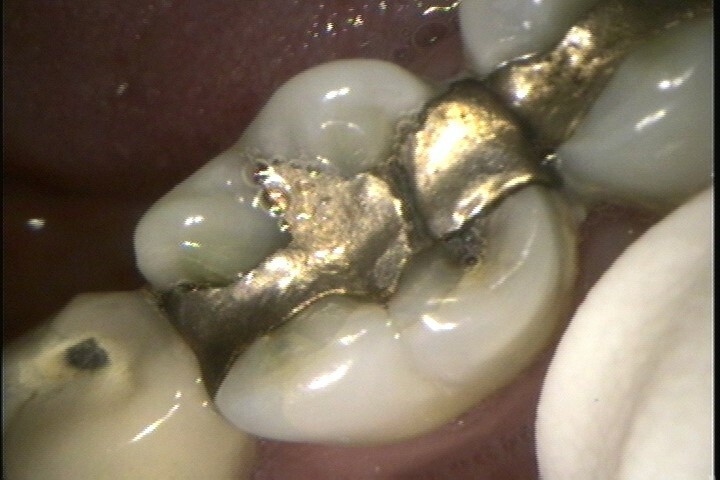 Old amalgam that has cracked and dislodged. 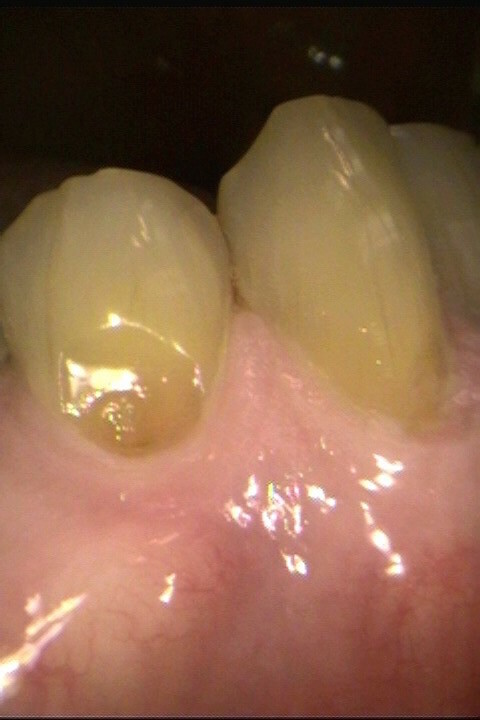 After we replaced with newer restorative materials. 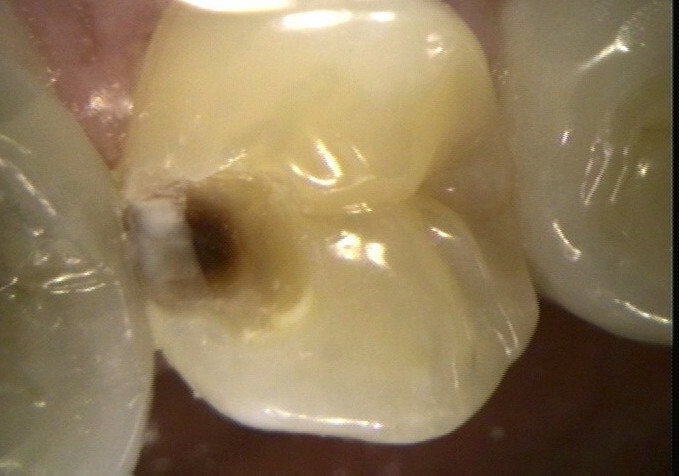 Before and after pictures of root abrasion repaired with tooth colored bondings. Here is another case to share with you. Mr. Z had several teeth wearing away at the gum-line. This is a common problem in adults. It is frequently caused by abrasion (like vigorous brushing). It is also caused by erosion (acids from foods) and even mal-occlusion. Once the enamel surface is worn away, the underlying dentin is vulnerable to bacteria and acids. 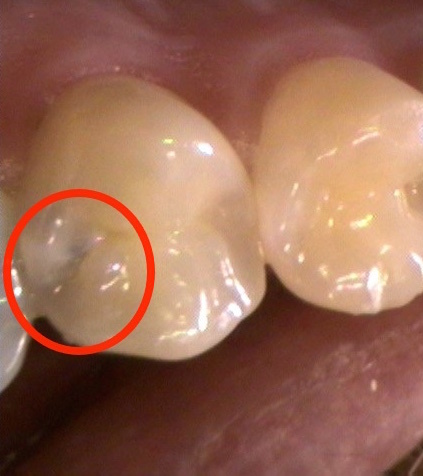 We need to remove that afflicted tooth structure before repairing the defect. Finally the teeth can be restored with a restoration that we match to each tooth’s natural color. 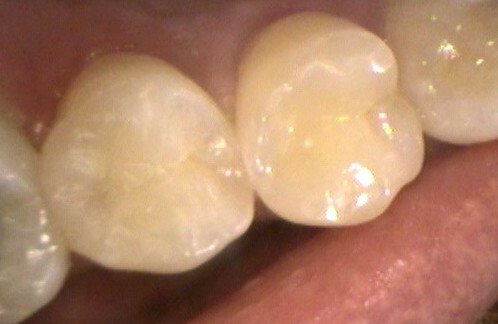 In the pictures, you will see the teeth with the defects. Next you will see the teeth with the defects outlined in red. 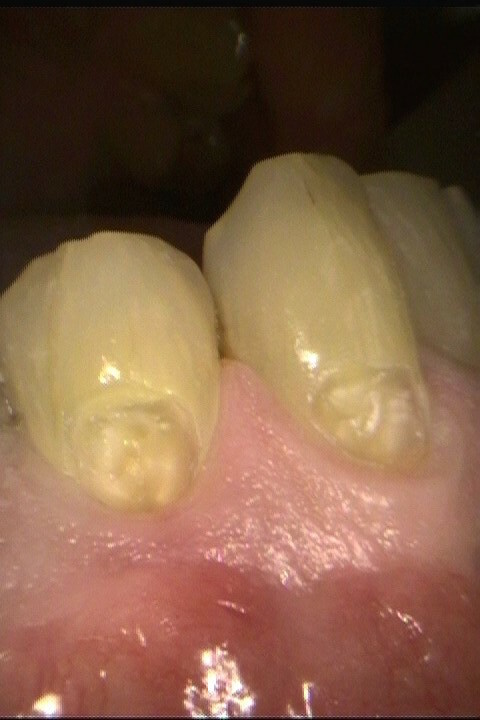 Then you will see the teeth with the carious structure removed. Lastly you will see the teeth repaired. 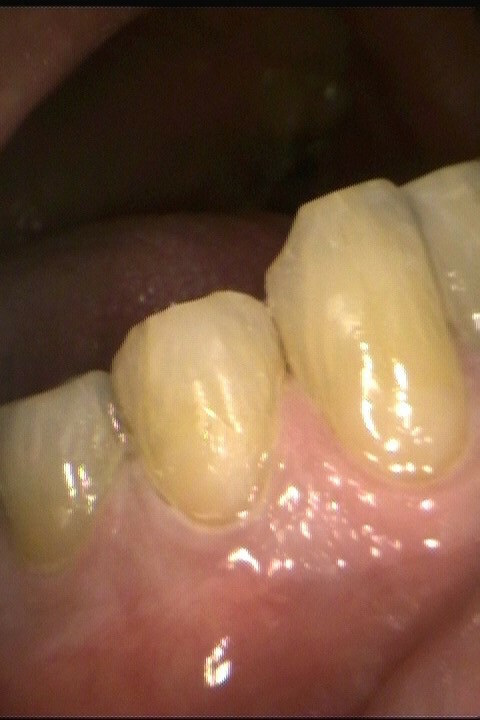 Before and After pictures of tooth decay being restored with a bonded tooth colored restoration. The flu season and your toothbrush…. 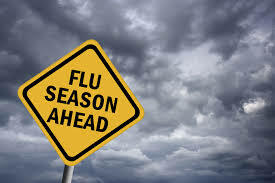 Cold and flu season is upon us. Believe me, I know. I was out with the flu last week! So what about your toothbrush? Should you throw it out during or after you’ve recovered from an illness? We recommend replacing your toothbrush every month or two, but that has more to do with the efficacy of the bristles than a concern for germs. As far as germs go, there are 2 types of infection; Viral and Bacterial. Once you’ve been infected with a particular strain of a virus, your body develops antibodies that make the likelihood of re-infection very low. 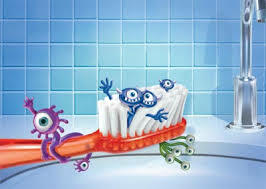 Those antibodies will protect you from re-infecting yourself even if the virus is still living on your toothbrush. With that said, it could be harmful to a family member that has not yet contracted the virus. Therefore, keep your toothbrush tucked away in a safe place away from family members that may want to tidy up around you. Don’t let your toothbrush come into contact with theirs. Refrain from using a couples/family toothbrush holder. Reinfection via bacteria is much more possible. Illnesses such strep throat, for example, are the result of an attack from bacteria such as a colony of streptococcal bacteria. These bacteria might remain on your toothbrush long enough to give you a second case of the illness. Some toothpastes, however, contain anti-bacterial compounds that would help protect you. Washing your hands frequently with hot soapy water remains the best way to prevent spreading the flu. Teach children to wash their hands. Have kids use soap and warm water, and rub hands for 20 to 30 seconds. A good rule of thumb is singing the ‘Happy Birthday’ song twice while scrubbing, to keep track of the time. Thanksgiving always stirs reflections of the year’s events. And our thoughts this year rest on a certain professional success. 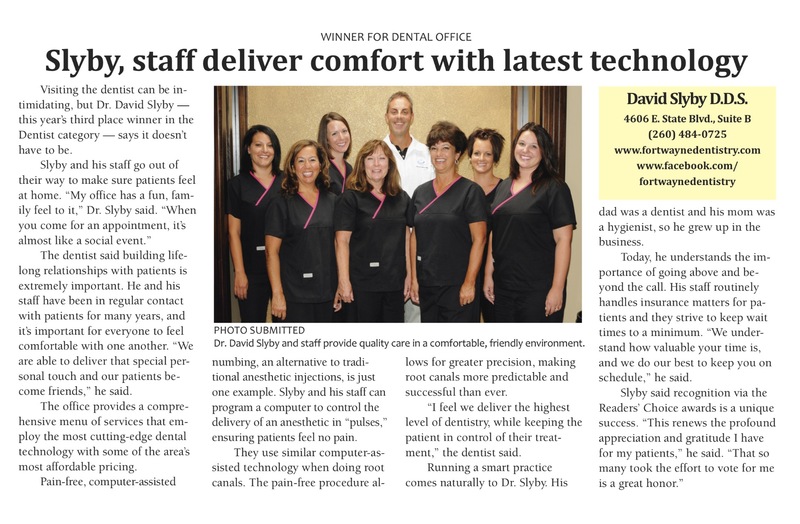 We are a winner of the area’s Reader’s Choice Award for dental practices. It was a competition hosted by Fort Wayne Newspapers and their affiliates. 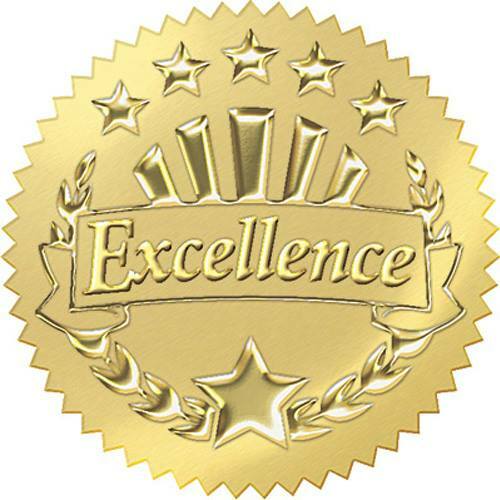 Considering we are a single dentist, it was no small honor to beat out so many of the large, multi-dentist practices in town. Thank you to everyone that voted for us. We are deeply moved by the expression of confidence. Here is the article that was included in the paper. Visiting the dentist can be intimidating, but Dr. David Slyby — this year’s third place winner in the Dentist category — says it doesn’t have to be. The dentist said building life- long relationships with patients is extremely important. He and his staff have been in regular contact with patients for many years, and it’s important for everyone to feel comfortable with one another. “We are able to deliver that special personal touch and our patients become friends,” he said. The office provides a comprehensive menu of services that employ the most cutting-edge dental technology with some of the area’s most affordable pricing. Pain-free, computer-assisted numbing, an alternative to traditional anesthetic injections, is just one example. Slyby and his staff can program a computer to control the delivery of an anesthetic in “pulses,” ensuring patients feel no pain. They use similar computer-assisted technology when doing root canals. The pain-free procedure allows for greater precision, making root canals more predictable and successful than ever. “I feel we deliver the highest level of dentistry, while keeping the patient in control of their treatment,” the dentist said. Running a smart practice comes naturally to Dr. Slyby. His dad was a dentist and his mom was a hygienist, so he grew up in the business. Today, he understands the importance of going above and be- yond the call. His staff routinely handles insurance matters for patients and they strive to keep wait times to a minimum. “We under- stand how valuable your time is, and we do our best to keep you on schedule,” he said. 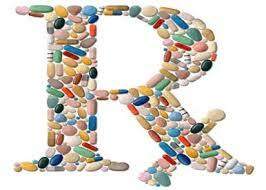 Over the counter and prescription drugs are a fact of life for many of us, young and old. You may be surprised to know that drugs of all forms and classes, even vitamins, minerals, and herbal preparations can have severe effects on your oral health. Regular dental checkups are important. At each appointment, report the medications you are taking and other information about your general health. 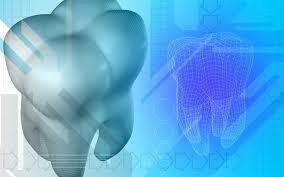 An updated health history can help the dentist identify problems and causes. Here are common side effects. Dry mouth can be caused by many factors and we’ve all experienced it at some point. It can happen when you are nervous, upset, excited, or under stress. It can also occur from radiation treatments, salivary gland disease, endocrine disorders, diabetes, stroke, and many other factors too. But the MOST COMMON cause of dry mouth is medication, both prescribed and over the counter. Almost every drug class has medications that list xerostomia as a side effect. Antihistamines, decongestants, high blood pressure meds, inhalers, muscle relaxants, pain killers, diuretics, antidepressants are just a few among the many forms of medications that can cause this condition. Drying irritates the soft tissues which can inflame them and make them more susceptible to infection. Even more concerning: Without the cleansing effects of saliva, tooth decay and other oral health problems become more common. Increasing fluid intake and taking frequent sips of water may help some people. Also, there are artificial saliva substitutes available. These help sustain moisture in the mouth. These products are popular and usually easily available at your local pharmacy. Avoiding smoking, caffeine, carbonated drinks and sugar can help also. Some prescriptions can cause sores, inflammation and even discoloration to the soft tissues in the mouth. These include chemotherapeutic agents, immunosuppressive drugs, oral contraceptives, and even blood pressure meds. 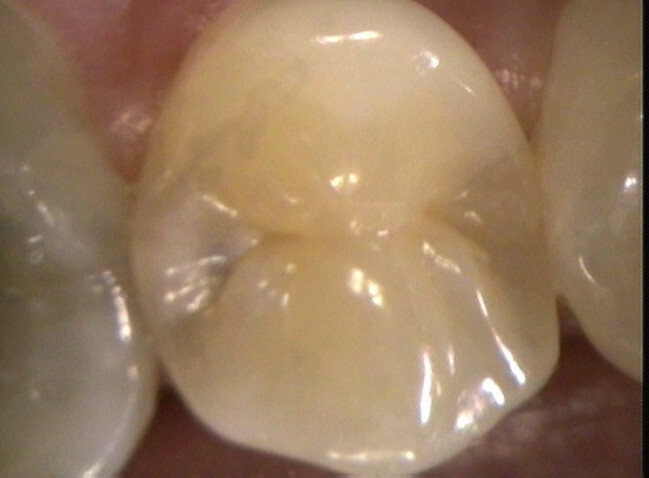 If you experience soft tissue reactions from these, let your dentist know. He or she may have some recommendations. Also, your prescribing doctor may be able to change the regimen to alleviate the condition. Some medications can result in the patient experiencing a bitter or metallic taste. Some may even experience diminished taste to foods and drinks. Cardiovascular agents, CNS stimulants, NSAIDs, inhalers and smoking cessation products all have been known to effect taste. Medications such as coumadin, warfin, aspirin, Plavix and even NSAIDS can thin the blood or prevent clotting. Although they are necessary and common, they can create bleeding problems during oral surgery or treatment for periodontal disease as well as other procedures too. Be sure to let your dentist know if you are on any such medications. Medications such as anti-seizure, immunosuppressant and calcium channel blockers (nifedipine, verapamil, diltiazem and amlodipine) can cause gingival overgrowth. Meticulous home care and regular dental cleanings can help keep inflammation minimal. Increasing the frequency of dental cleanings may be a good idea for these patients too. Tetracycline can cause permanent discoloration of the teeth if the drug was used during tooth formation (2nd half of a pregnancy or for infants and toddlers). Chlorhexidine rinse is a dental antibiotic rinse that can stain the teeth brown. However, that is easily removable with a dental prophylaxis. Patients using oral inhalers for asthma often develop oral candidiasis, an oral fungal infection. One way to abate the risk is to rinse with water after using the inhaler. Also saliva substitutes and ingestion of active yogurt can be beneficial. Through the Ages…. 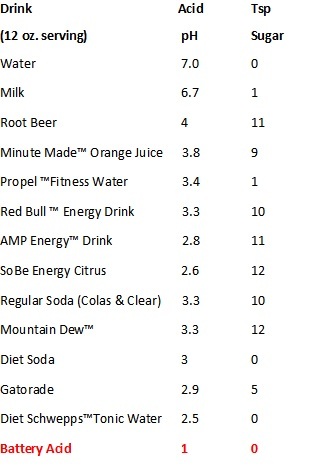 Acids: Energy Drinks, Juices, Sodas, and More. There are new villains in the fight against decay. Trendy drinks are causing decay and a loss of enamel at an unprecedented rate in modern times. Energy drinks, boxed juices, sports drinks, and soda are laden with sugar and acids. Acid Softens the enamel and chemically dissolves the outermost layer. Sugar feeds the bacteria that cause plaque and tooth decay. The effects of sugary drinks are present long after swallowing. The saliva stays acidic between sips. So the enamel is constantly getting insulted from the first sip until long after the drink is gone. Super sizing drinks has become a national expectation. As mentioned previously, sipping small amounts over time leads to perpetual destruction. The longer it takes to get through a beverage, the more damage there is to your mouth.